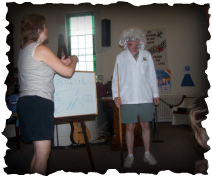 Vacation Bible School is co-hosted by the Antrim Baptist Church and The First Presbyterian Church. This year it will held at the First Presbyterian Church from 5:00 to 8:00 pm. The theme this year was "Shipwrecked-rescued by Jesus." The evening begins with a free supper, followed by an exciting evening together. 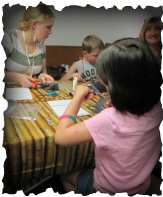 At VBS, the children will discover that they Jesus carries them through life's storms. 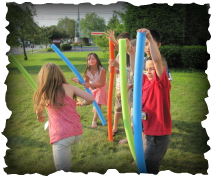 Kids participate in memorable Bible-learning activities, sing catchy songs, enjoy skits, play teamwork-building games, make and dig into yummy treats, and experience one-of-a-kind Bible adventures. Plus, kids learn to look for evidence of God all around them through something called "God Sightings". Each day concludes with a closing that gets everyone involved in living what they’ve learned. While the children are involved in their activities there is a Bible Class for adults. This annual community event is jointly sponsored by The Antrim Baptist and The First Presbyterian Churches. Ages 3-99 are welcomed to be a part of it For more information and/or to register your child, call 588-6614 or email cherbouch@gmail.com. We always have some crazy skits! Great games makes great fun!